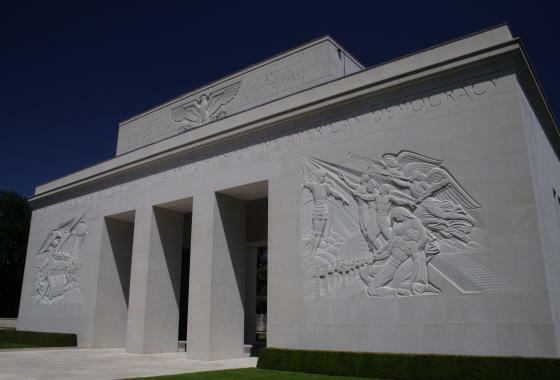 The photo to the left is the "Memorial Building" at Epinal and the photo to the right is the "Wall Of The Missing" at Epinal. 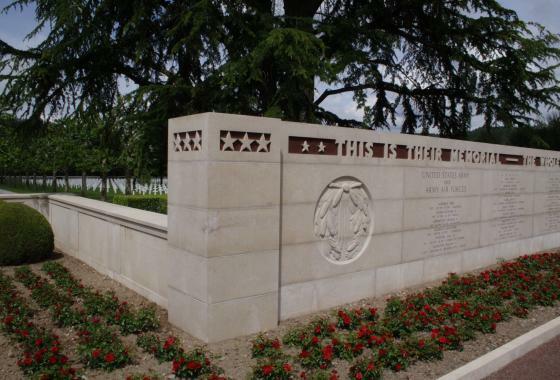 The following "Highlighted and Noted Burials" listing was created in the memory of the brave men and women who are interred in the Epinal American Cemtery by groups that gave their all for their State and Country during World War II. Soldiers, Sailors, Merchant Marines, and Civilians are all included on this listing. There are personal "online memorials" for each of these honored men and women that were created for them by using the "Find A Grave" website. You will see a blue " Yes " behind their names and by clicking on the " Yes " you will see their personal memorial that has been created for them. On "many" of the online memorials you will see a small biography for each soldier which includes: parent's names, where they lived and where and how they actually died. If you see one without a bio and you have information on them please email me and I'll do my best to update their records. They are all " HERO'S " in my book and deserve all the recognition they can get !! AM = Awarded the " Air Medal " ~ Meritorious achievement while participating in aerial flight and/or single acts of merit or heroism, or for meritorious service. AM* = Awarded the " Air Medal with one Oak Leaf Cluster " ~ Second occurrance of being awarded the Air Medal. AM** = Awarded the " Air Medal with two Oak Leaf Clusters " ~ Third occurrance of being awarded the Air Medal. BDFC = Awarded the " British Distinguished Flying Cross " ~ Awarded for heroism or extraordinary achievement while participating in an aerial flight by England. BS = Awarded the " Bronze Star " ~ 4th highest award for bravery, heroism or meritorious service. DFC = Awarded the " Distinguished Flying Cross " ~ Awarded for heroism or extraordinary achievement while participating in an aerial flight. DSC = Awarded the " Distinguished Service Cross " ~ 2nd highest award for extreme gallantry and risk of life in actual combat with an armed enemy force to a member of the U.S. Army & Army Air Force. FCDG = Awarded the " French Croix de guerre " ~ Awarded by France to soldiers who distinguish themselves by acts of heroism involving combat with the enemy. LOM = Awarded the " Legion Of Merit " ~ Awarded for exceptionally meritorious conduct in the performance of outstanding services and achievements to all military branches. MOH = Awarded the " Medal Of Honor " ~ Highest military honor, awarded for personal acts of valor above and beyond the call of duty. NC = Awarded the " Navy Cross " ~ 2nd highest military decoration for valor that may be awarded to a member of the United States Navy, U.S. Marine Corps, or U.S. Coast Guard. PH = Awarded the " Purple Heart " ~ Awarded for being wounded in action. PH* = Awarded the " Purple Heart with one Oak Leaf Cluster " ~ Awarded for being Wounded in action twice. PH** = Awarded the " Purple Heart with two Oak Leaf Clusters " ~ Awarded for being Wounded in action three times. POW = Awarded the " Prisoner Of War Medal "
SS = Awarded the" Silver Star " ~ 3rd highest award, awarded for gallantry in action. That has " 100% " of all headstones and memorial's photographed ! who took thousands during his own personal time! Grave 37 " Yes "
Grave 7 " Yes "
Grave 55 " Yes "
Grave 20 " Yes "
Grave 1 " Yes "
Grave 10 " Yes "
Grave 28 " Yes "
Grave 30 " Yes "
Grave 38 " Yes "
Grave 27 " Yes "
Grave 54 " Yes "
Grave 29 " Yes "
Grave 16 " Yes "
Grave 15 " Yes "
Grave 57 " Yes "
Grave 56 " Yes "
Grave 51 " Yes "
Grave 50 " Yes "
Grave 12 " Yes "
Grave 21 " Yes "
Grave 62 " Yes "
Grave 69 " Yes "
Grave 53 " Yes "
Grave 52 " Yes "
Grave 64 " Yes "
Grave 65 " Yes "
" Was the most decorated unit for its size and length of service in the history of American warfare "! Grave 68 " Yes "
Grave 58 " Yes "
Grave 49 " Yes "
Grave 9 " Yes "
Grave 32 " Yes "
Grave 6 " Yes "
There are a Total of 138 African-American soldiers interred in Epinal ! Grave 46 " Yes "
Grave 42 " Yes "
Grave 47 " Yes "
Grave 44 " Yes "
Grave 31 " Yes "
Grave 63 " Yes "
"And one set of cousins"
Grave 18 " Yes "
Grave 19 " Yes "
( He was also the Step-Son of Pvt Harold E. LePow ~ below ) Private 517th Para. Inf. Grave 36 " Yes "
Grave 35 " Yes "
Grave 43 " Yes "
Grave 26 " Yes "
Grave 41 " Yes "
Grave 40 " Yes "
Grave 48 " Yes "
Grave 60 " Yes "
Grave 72 " Yes "
The " Office of Strategic Services " (O.S.S) was a predecessor to the current " Central Intelligence Agency " (C.I.A.). See more about the Office of Strategic Services (O.S.S) during WW II ~ " Click Here " ! Grave 34 " Yes "
Grave 71 " Yes "
Grave 23 " Yes "
Grave 2 " Yes "
Grave 17 " Yes "
Grave 4 " Yes "
Grave 66 " Yes "
Grave 14 " Yes "
Loree, Herbert A. ~ DSC PH* ~ France ~ Corporal 111th Eng. Combat Bn. Grave 25 " Yes "
Grave 45 " Yes "
Grave 13 " Yes "
Grave 8 " Yes "
Grave 39 " Yes "
Grave 3 " Yes "
Chapman, Lester I. ~ n/a ~ France ~ Civilian Camp Shows Inc. Grave 22 " Yes "
Young, Gaius W. ~ n/a ~ France ~ Civilian Camp Shows Inc.